Also up for grabs is the less exciting prize of nearly $20,000 worth of home theater equipment. Square Enix has hit upon a fairly unique pre-order incentive for Deus Ex: Human Revolution: If you pre-order the game from GameStop, you have a chance to win a cybernetic arm, as well as a large stack of electronics equipment. In Human Revolution, Jensen is badly wounded during an attack on the company he works for, requiring cybernetic augmentation in order to survive. 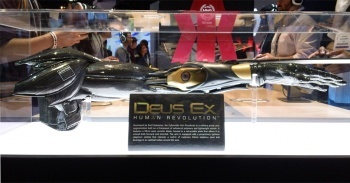 The arm in question is a scale replica of one of the mechanical arms that Jensen wakes up with after the attack, which Square Enix says is worth around $1,000. The prize also includes a 3D TV, home theater seating, three gaming consoles, and a $500 GameStop gift card. The total value of the prize is estimated to be around $20,000. There are a few hoops you'll need to jump through in order to be in with a chance to win the prize however. First and foremost, you'll have to live in the US, meaning that European fans - like me - are out of luck. You'll also need to be a PowerUp Rewards member, although the free subscription will do just fine. You also have to actually buy the game when it comes out before the cutoff date of August 30th. You can enter by mail as well however, which would seem to bypass many of the aforementioned hoops. To enter by mail you need to send mail a card with your full name, phone number, email address and mailing address to "The Marketing Arm Inc. Attention: "Deus Ex: Augment Your Room Sweepstakes", #140, 233 Rock Road, Glen Rock, NJ 07452." Even without all the home theater equipment, the arm would be a pretty good prize for a lucky fan. Hopefully the winner will have somewhere special to put the full-sized arm.